"If I can touch even just one life today, then it’s all worth it." Chantelle Adams began her career in education with special needs children. Her older brother also did in group homes, and was a big influence in her life. He suddenly passed away after we recorded our conversation for this podcast. His example lives on in Chantelle, as she chooses to live and lead from a place of love, understanding, and curiosity. 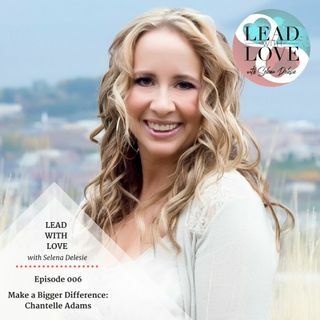 In this episode, Chantelle shares stories of love in action, ... See More overcoming failures and fears, raising three boys to be open-hearted, her brother’s influence, and how the death of a beloved friend awoke her to embrace courage as a guiding force. Throughout her life, she has asked herself, “How can I make a bigger difference?”. She believes that embracing our heart is the way forward in business, families, and how we give back into the world. I invite you to listen, be inspired, and reflect on how you too might make a bigger difference today. Chantelle Adams is a Professional Speaker, Speech Stylist and Courage Igniter. Throughout the past 5 years she has delivered over 800 speeches and added more than 6 figures to her business through speaking. Now she teaches change-makers how to turn their message into a movement to make a massive impact in the world. She has started her global movement, The Courage Collective, where they are on a mission to face 1 million fears, share 1 millions stories of courage and donate $1 million to charities around the world. Connect with Chantelle at www.chantelleadams.com.